I make my will. First I leave all my best books, and all my books, to the Rev. Mr. Nott*. Thirdly, I beg Mr. Nott, whatever money he finds me in possession of, to distribute to the poor, and all my money I leave to the poor to them. I leave with Mr. Nott all my papers which he knows of, and I beg him to burn those which he sealed up. I beg the Prayer Book which Lady Elgin* gave me may be given to the Bishop of Exeter*, and the Bible Lady Elgin gave me may be given to him also. Also all my playthings the Miss Fishers are to have. And lastly, concerning Mrs. Gagarin* and Mrs. Louis*, I beg that they may be very handsomly paid, and that they may have a house. 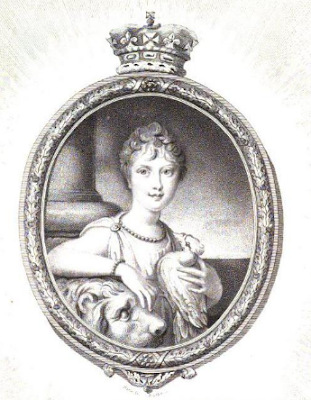 Lady de Clifford* the rest of my jewels, except those that are most valuable, and those I beg my father and mother, the Prince and Princess of Wales, to take. Nothing to Mrs. Udney*, for reasons. I have done my will, and trust that after I am dead a great deal may be done for Mr. Nott. I hope the King will make him a Bishop. My birds to Mrs. Gagarin and my dog or dogs to Mrs. Anna Hatton my chambermaid. Later, on Mr. Nott’s suggestion, Charlotte decided to leave something to Mrs Udney, whom she greatly disliked, something too. However, this innocent will, made on the spur of the moment, got Mrs Campbell fired. The Prince of Wales, Charlotte’s father, believed it was written under the influence of the sub-governess and asked her to resign. To Charlotte, who was very attached to her, was told she quit for health reasons.